Pickled onions are a true British treasure! We often eat them straight out of the jar, sliced in sandwiches or accompanying a tasty Ploughman’s lunch. The Ploughman’s lunch is a great British pub lunch dish consisting of cheeses, ham, bread, pickled onions, pickle relish and various raw vegetables of choice. 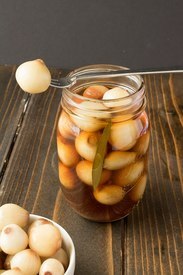 Pickled onions are so incredibly easy to make and are a great snack to have on hand as they can also be used with so many other dishes. The hardest (well, most tedious) part to this recipe is peeling the pearl onions, but I do have a “Ginger Tip” for that in the recipe. The onions must pickle for a few weeks so you must be patient (I know, it’s hard!). The results are a delicious, vinegary, slightly sweet onion with the perfect amount of crunch. They are ever so delectable as a burger topping with melted cheese or chopped up and added to salads. Enjoy!